Courtesy of Catalina Channel Swimming Federation. 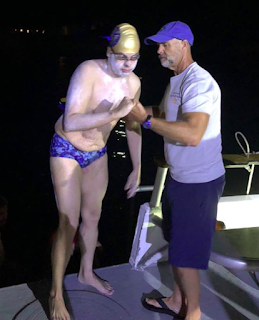 Catalina Channel Swimming Federation announced the 17 hour 14 minute butterfly crossing of the Catalina Channel by John Batchelder. After departing from Smuggler's Cove in the early morning, Catalina Channel Swimming Federation reported, "Batchelder swam upstream in rough sea conditions before landing at Doctor's Cove on Catalina Island. John is the third solo swimmer to swim butterfly across the channel and he is the first to swim butterfly from the mainland to Catalina. Veteran Catalina Channel swimmer Rebecca Nevitt was on board the Pacific Star as John’s crew chief, as well as marathon swimmer extraordinaire Sarah Thomas who was on board to support John's swim. John York, Dan Simonelli and Lynn Kubasek observed the swim for the Catalina Channel Swimming Federation."